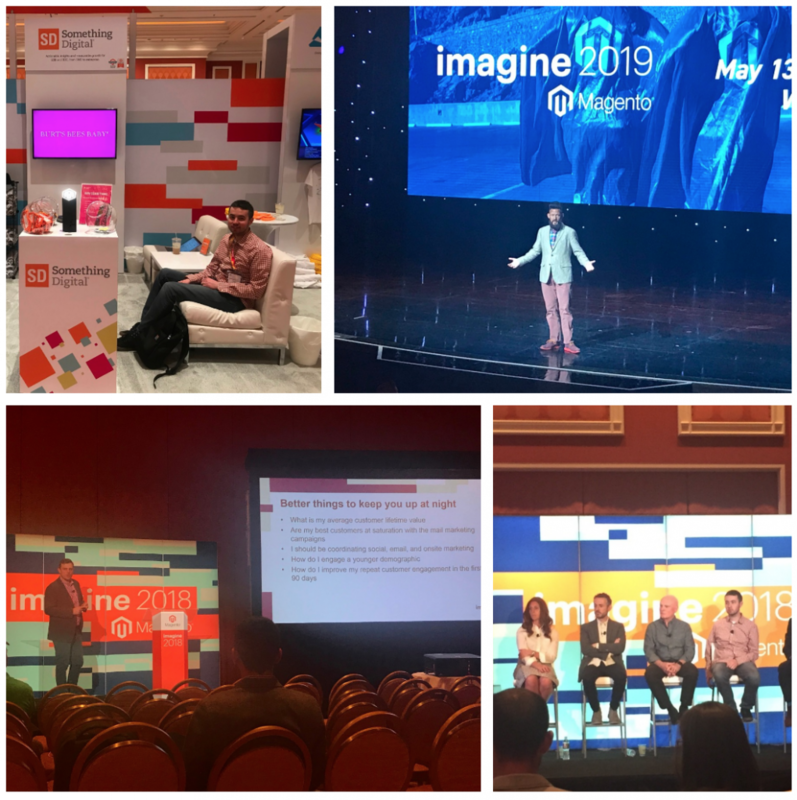 At Magento Live EU, Magento provided a big update on the Magento Association, a new independent non-profit organization that was announced earlier this year at the Magento Imagine 2018 conference. In his keynote session, Magento CEO Mark Lavelle said “The Magento Association… has come to life and is moving forward”. He revealed that the Association is being spearheaded by a community Task Force on which Something Digital’s very own Brian Lange is seated. The other task force members are Jenna Warren (Creatuity), Susan Peterson (Wagento), Guido Jansen (Randstad), Alessandro Ronchi (Bitbull), Danny Verkade (Cream), and Gabriel Guarino (Simplific). The task force is focused on mission, culture, bylaws, strategy, and establishing the first board of directors. Criteria for selection to the task force can be found here. He announced the Association’s mission statement which was created by the Task Force: “The Magento Association advances and empowers its global community and commerce ecosystem through open collaboration, education, and thought leadership”. Mark finished with “Thank you to the members of this task force – I think they deserve a round of applause”. Magento is employing SmithBucklin, an association management company based in Chicago, to assist with creating the new organization. SmithBucklin has assisted with association formation and stewardship since 1949 and has consulted with groups from several industries including Fuel, the Palo Alto Networks User Group and OHUG, the Oracle HCM User Group. Welcome and reflect all members of the global Magento ecosystem. Seek out and embrace a diverse community. Be transparent and accountable to each other. Act with thoughtfulness, fairness and integrity. Focus on activities that create mutual success. Encourage and empower collaboration amongst stakeholders. Challenge each other to continuously adapt and grow. Safeguard the long-term financial viability of the association. Support each other in keeping the Magento ecosystem healthy. Something Digital is looking forward to the impact and benefit of the Magento Association and extends a big congratulations and thank you to Brian and the rest of the Task Force. What is Adobe Experience and How is it Applicable to Your Business? This past May, Adobe acquired Magento “in a bid to capture a bigger slice of the digital-commerce industry from Salesforce.com Inc. and Oracle Corp.” This news may seem as if it has little bearing on your day to day life, but it’s actually worth thinking about, especially if you plan on purchasing a third-party solution to round out your Magento solution in the next year or two. First, let’s address some semantics. Adobe has two distinct product suites with similar names that people use interchangeably: Adobe Experience Manager and Adobe Experience Cloud. They’re not the same. The former is an enterprise-level platform, used by the likes of Nissan and Hyatt. Adobe Experience Cloud is a suite of Adobe-built or Adobe-acquired solutions integrated into a single platform. That’s where Magento sits. Adobe Experience Cloud offers a lot of functionality that ecommerce managers need, many of which are redundant to solutions available via the Magento ecosystem. Most well known is Adobe Analytics, an enterprise-levelt analytics platform, formerly known as Omniture Sitecatalyst. Why would you consider using Adobe Analytics? If your business is competitive to Google, you may not feel comfortable sharing your data via Google Analytics. If that’s the case, Adobe Analytics may be a good option for you. Adobe Experience Cloud also offers Adobe Audience Manager, which is a data management platform (DMP) that allows you to glean insights into who your audiences are, create segments based on those insights, and offer a relevant experience to those audiences across all of your touch points (your mobile app, website, social media, forums, etc). The DMP will allow you to identify commonalities among certain audience members — say moms who live on the west coast and like red shoes, and moms on the east coast who prefer blue shoes. You can create a “red shoe” and “blue shoe” audience segment, and ensure that when they go on Facebook or your mobile app and see your ads, those creatives will feature the right color shoe. Additionally, it can link multiple devices to the same user, so that you can recognize the consumer and present a unified experience, regardless of whether she interacts with your brand via your website or mobile app at home or in the office. Another tool offered in the Adobe Experience Cloud is Adobe Advertising, which includes paid search and ad buying functionality, along with access to an ad network with personalization capabilities. Adobe Advertising allows you to launch multi-channel digital campaigns at scale, all from within Experience Cloud. Adobe Target, formerly Omniture Test and Target, is a personalization solution that makes it easy to identify your best content through tests that are easy to execute and can deliver the right experience to the right customer. And of course, with Magento, Experience Cloud now has a robust ecommerce platform. There are some interesting things about this arrangement. For instance, Experience Manager, the CMS, also sits in that ecosystem, and that elevates Magento’s platform to a unique position: it is the only component of the Experience Cloud that is a platform-based solution with an ecosystem of solutions that are competitive to these other Adobe products products. The Adobe acquisition of Magento, and Magento’s integration into Adobe Experience Cloud means you have access to Adobe’s personalization and audience segmentation solutions, which are more sophisticated because they leverage machine-learning optimization. As a manager of an ecommerce site, the real value of the Adobe product suite will be its eventual seamless integration with Magento. In the future, you will be able to adopt an Adobe product — Adobe Audience Manager or Adobe Target — with just a click of a button. This prospect will offer more than convenience (although convenience is certainly a plus). The seamless integration will mean that the applications will be able to share data, and inform how each is optimized. For example, the personalization you drive on your website can be tied back to your advertising campaigns. With all solutions within the Adobe ecosystem fully integrated, you will have a coordinated solution that makes it easy to support the entire lifecycle of the customer. Finally, with Magento integrated into the Adobe Experience Cloud, your business will have an easy path to migrate into a much larger platform. Those are some of our initial thoughts on the Adobe acquisition of Magento. We will keep you informed of the interesting opportunities as they rise, so that you can plan for the future.